Interview with O! Jolly!, Knit Textile Designer! Hi, guys! I hope you’re all well! OK, I know that most of us who sew are into fabric, but I’ll speak for myself and say that while I like sewing, I LOVE fabric. But I struggle a bit because I’ve learned that the textiles industry isn’t very earth-friendly and doesn’t have a great track record for human rights. Of course, not all fabric is produced in an unethical way, but it’s really hard to know where each bolt of fabric comes from. 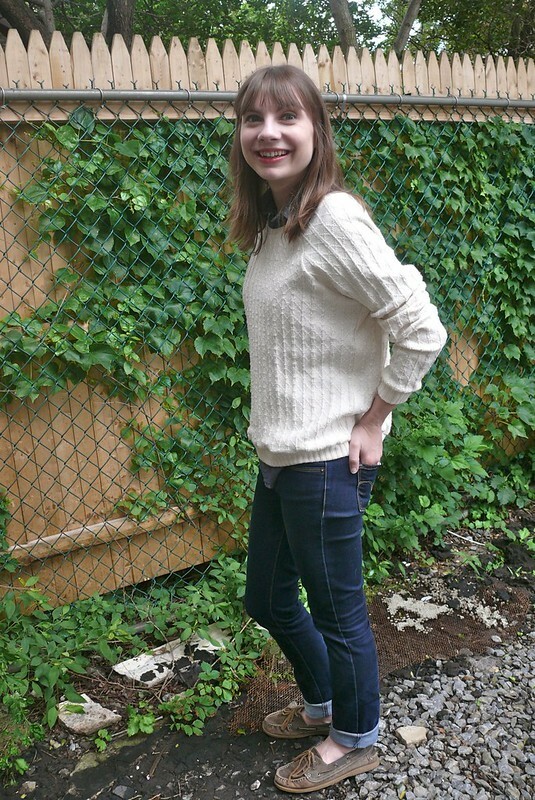 So I was really excited when I heard that Olgalyn Jolly was producing a line of cotton sweater knits that are grown, ginned, spun, and knit in the United States! The knits are non-GMO and they’re not dyed- the beautiful brown and green are grown-in color! It’s exciting to see fabric options that are healthier for the earth and for the producers. I’m guessing I’m not the only one who’s excited to learn more about healthier fabric choices, so let me introduce you to Olgalyn! Here’s Olgalyn in a gorgeous Grainline Morris blazer made from her color-grown Mesa plaid… click on the picture to go to her blog post! Olgalyn is a knit textile designer here in NYC; she creates beautiful sweater knits for fashion designers and now for home sewers! She also blogs as O! Jolly! I’ve gotten to know her through the large circle of sewing enthusiasts here in New York and I’m really glad that I have. She is gracious, kind, and warm, and is the kind of person with whom you can feel instantly at ease. But for those of you who are far away, I encourage you to get to know her through her Instagram. Her photos always inspire me, whether she’s snapping pics of her own designs, cool knitwear she sees in her travels, or her neighborhood. 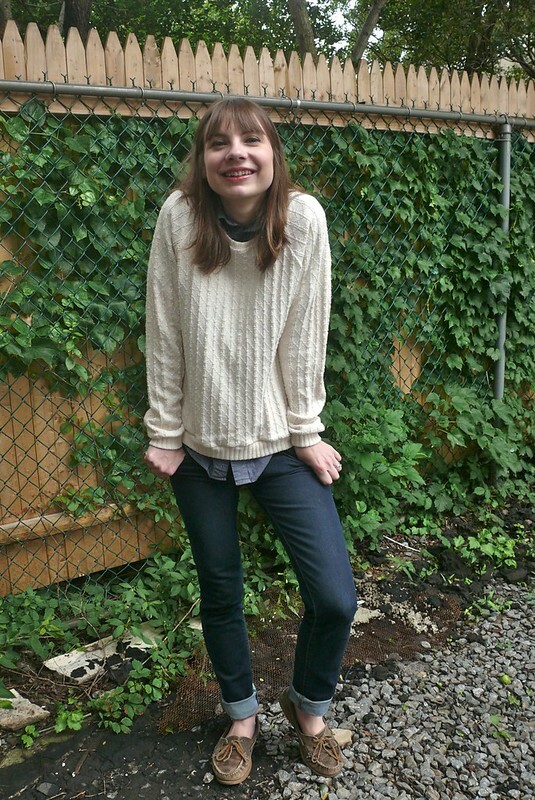 Her journey to becoming a knit designer is an unusual one, and her love for knits is so exciting that I’ll let her tell you herself! Take it away, Olgalyn! 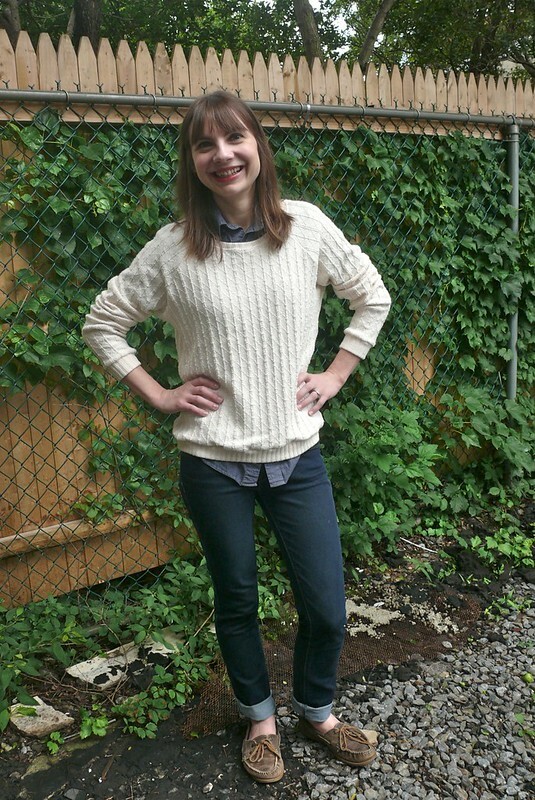 Q: I’d love to hear about your journey to becoming a knit designer! What was the path that led to where you are now? Did you study textile design? And why knits? A: I had a career in show business; I was a dancer who also sang. Dancers can have quite limited careers. The body simply gives out or acts up one body part at a time. I’d been dancing since I was three and wanted to find something else that I was passionate about and had been thinking about my next career for a couple of years before I left the biz. I was on tour in Japan with the international company of a Broadway show in the mid 80s at a time when I was also becoming aware of the Japanese fashion designers who were achieving international fame. I fell in love with the color combinations and concepts from from Kansai Yamamoto and the shapes and textures from Yohji Yamamoto. I especially loved the sweaters. I appreciate knits in their many forms. Knits can be form fitting without darts or they can be extravagantly draped. I enjoy the process of designing knitting stitch patterns. There’s a formality; it’s a grid. You can build texture, play with color, or even shift the grid. I never took a prescribed course of study, which I regret a little bit now. Instead I took the technical classes I really wanted to take with the people I wanted to study with, kind of an à la carte education. I studied Weft Knitting Technology with George Tay at Fashion Institute of Technology, who’d been highly recommended by my Draping teacher at Parsons when she found out I loved knits. At Parsons I also studied with Susanna Lewis, author of my absolute favorite machine knitting technique and resource book, A Machine Knitter’s Guide to Creating Fabric. I took several other classes at FIT over the years. I made sweaters for other designers and designed sweaters under my own small label for a little while as I gradually began to understand that the part that really got me excited wasn’t the sweaters. It was designing the knit fabrics — coming up with stitch patterns, trying the patterns out with various yarns and yarn combinations. I didn’t get to specialize in designing sweater knit fabrics until years later however. Q: How does your design process change when you’re designing for home sewers? A: My design process changes significantly depending on whether I’m working with a client (fashion designer) who has a strong idea of the type of design she wants or if I’m submitting work to an agent who’s been “forecasting trends” or if I’m designing independently. Because my new sweater knit fabric line for home sewers was going to be exclusively for cutting and sewing by people who do don’t necessarily do this as a profession, I wanted this collection to be relatively stable. I made certain design choices so that someone who was venturing into the wonderful world of sweater knits would have success their first time. Sweater knits, otherwise, can be notoriously unstable if there’s a lot of openwork or if the fabric is loosely knitted. Q: Why did you choose cotton for this collection? A: I chose cotton for this collection because there simply aren’t enough cotton sweater fabrics available to home sewers. 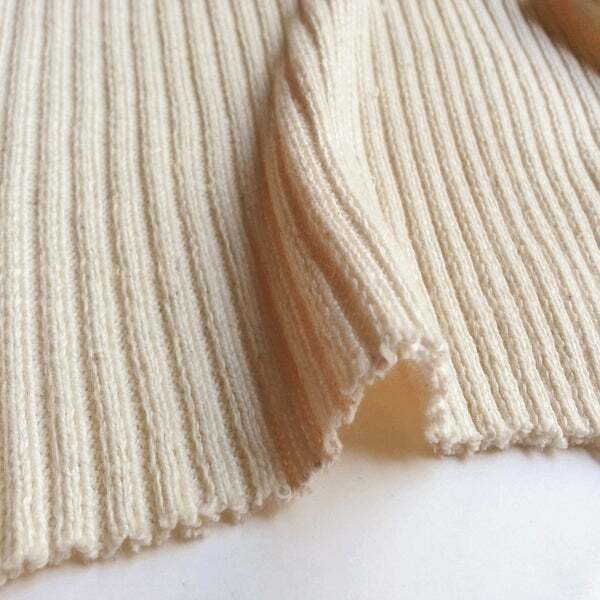 I absolutely love wool and hope my next collection will include wool, but cotton is a true easy care fabric, that can make beautiful sweater fabrics and therefore beautiful sweaters. Q: I’m really interested in natural dyes and more earth-friendly textiles, but before your new collection, I’d never heard of color-grown cotton. It’s such an exciting idea! I’d love to hear more about how it’s grown and processed! A: As I understand it, cotton grows naturally in various shades in parts of North and South America and Asia, but the strength and longer staple length of white cotton made white cotton more favorable early on for commercial development. Sally Fox is the person usually credited with the breeding of color cotton in this country in the late 1980s. She selected for qualities that would allow the color cotton lint to be spun in conventional mills. Color cotton began to be used commercially in the 1990s by a few commercial brands. I remember that Levi’s used color cotton for a little while. I don’t know if they still do. Sally Fox also has her own line of products. The yarns I’ve used for my new fabric originate from a different seed stock than Sally Fox’s. I was so excited when I was able to find a source of this beautiful yarn! All cotton used to make these yarn was grown in the United States by farmers who use sustainable growing practices. The color cotton is spun with a natural white cotton to create the earthy pastels I’m using, giving a very subtle heathered look to the color jerseys. Q: What’s next for O! Jolly!? Do you plan to introduce any new ethical fibers to your shop? A: I hope so. I was recently introduced to an Oregon rancher whose sheep are the source of the most wonderful wool. The ranch is 30,000 acres and the people who live and work the ranch take very seriously their stewardship of the land, their domestic animals, and the wildlife. Once one’s aware of the impact that the textile industry can have on the earth and human lives, it’s very difficult to go back to conventionally produced textiles. Right now I’m at the very beginning of a transition to ethical fibers professionally with my fabric design and also in my home life, just asking questions and taking steps, little by little. I’m glad there are alternatives available, but sometimes they’re hard to find and they’re usually more expensive. (Yes, that means buying less!) 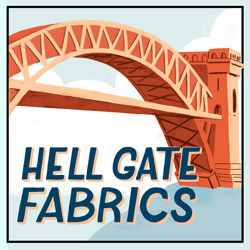 I hope that the sewing community finds the ethically produced textile a valuable and worthwhile product and will seek it out, whenever possible. Thank you so much for telling your story, Olgalyn! It’s so fascinating to learn more about you! If you want to know more about O! Jolly! knits, check out the links below. 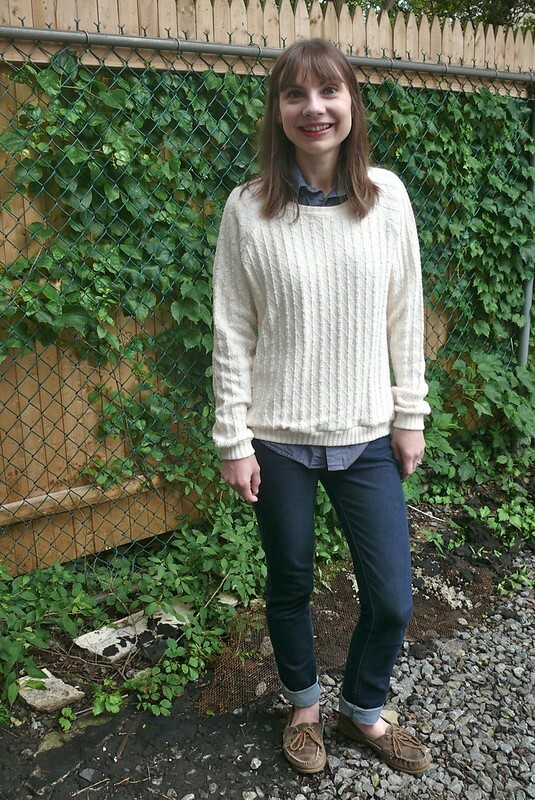 I’ll also be blogging a garment made with one of her gorgeous sweater knits very soon!